Mr. Ake was one of the participants at our audio book production workshop, held in March this year. 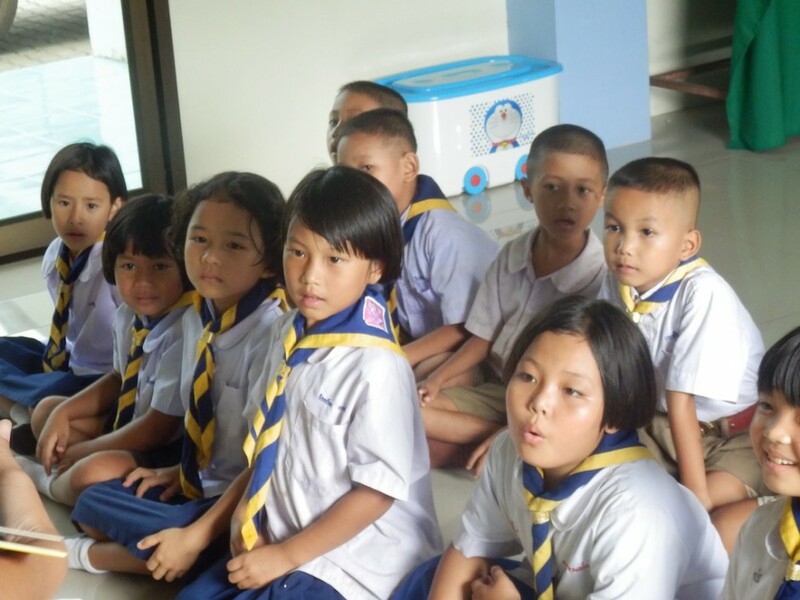 After learning the techniques, he set up a group called “Audio Book from My Heart” at Phrao Withayakhom School where he works as an English teacher. 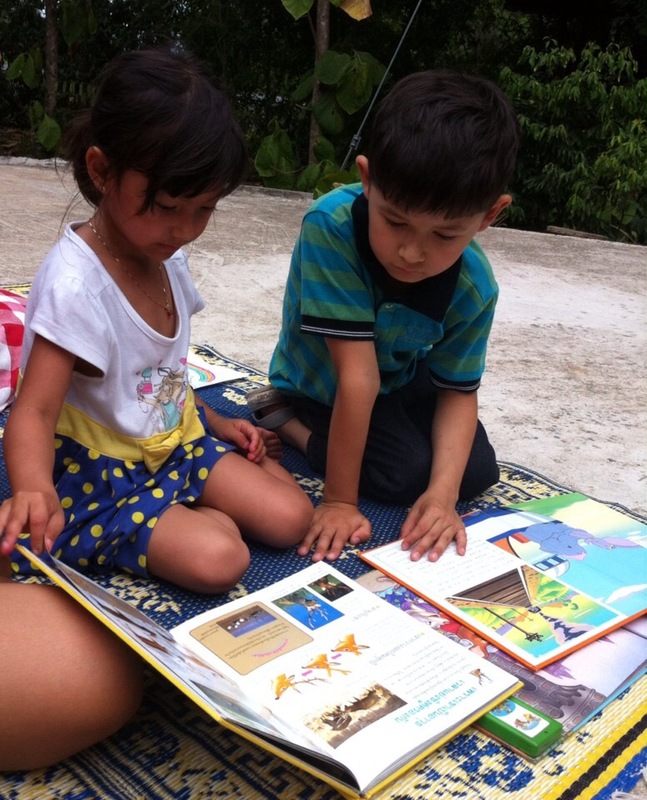 Throughout this term, all of the fifteen members in the group learned how to read out loud, and read one picture book each, which will be burned onto CDs, and distributed to around a dozen blind schools in the country. ARC does not have a professional sound studio, and our Rang Mai Library has too much echo for the recording. So I tidied up my little bedroom a little, and used the portable recording box to absorb the echo. I was amazed how motivated all the students were, and they picked perfect book for their own voice. In the stiflingly-hot bedroom with doors and windows closed and fan turned off, we had so much fun thinking about the voice of each character and making different versions passage after passage. Those of you who live or have lived in Thailand must know that we can see a lot of security guards all around the country. Department stores, airport, bus terminals, stations, schools, government buildings… I cannot even imagine how many people stand on guard for all of us. But do you know that they play very essential roles for life of persons with disabilities–especially blind travellers like me? They are always there to help me navigate through the caotic city of Bangkok, get on the right bus at the terminal in up-province, and even to go shopping. 7. At National Stadium station, from the gate to the platform again. I know that most of security guards might not be on Facebook, and nor do they read English, but I just want to take this chance to express my gratitude for their work that is rarely appreciated publicly. Brothers and sisters, without your help, my life in Thailand would have been much harder than it is! I regard myself as quite independent in terms of daily life including mobility. I go anywhere I want to go on my own, although I do ask my friends to go with me in some occasions, like shopping clothes. I started to walk around without sighted guide when I was 15 as I entered a boarding school 800 km away from my hometown. There was no protective family and caring neighbors there. It was not easy at first as I am very bad at directions up to now, but practice makes somewhat close to perfect, right? So I have taken it granted that I can move around like any other people. But… it seems that the country mouse has gotten used to the city life a bit too much and forgot about the countryside. Near my house, there is a bus stop, yes. But the bus comes only a few times in an hour (if any). Almost everyone move around on their neat motorbikes, if not vehicle. So how do I move around? Well, lucky me again. My colleagues and friends here comes to pick me up and drop me at home every day when I go to work at Warm Heart office. If I need something to eat, someone can take me on a motorbike. It’s just like when I go back home in Kochi… I totally depend on people around. The only difference here is that I have to work constantly, not just relaxing at home with occasional outings. Or, maybe it’s easier if I get a horse, and train him to be my guide horse that I can ride anywhere in this beautiful countryside! Today, I received a call from the mother of a blind boy. The boy’s family lives in Srisaked province, hundreds of kilometers away from Bangkok, and he goes to a blind school in Roi-et province under Christian Foundation for the Blind in Thailand (CFBT), which is even further away in the northeast. His mother told me that he is at home as it’s the summer break now. Here is a little chitchat I had with him over the phone, which happens to be the one of the happiest conversation I have ever had in Thailand. Yoshi: Hi! How are you doing, dear? Yoshi: Are the teachers kind to you? Boy: Yes, they are kind. Yoshi: Have you got new friends yet? Boy: Oh, I have sooo many friends! Why do I think this was one of the happiest conversation I have had in Thailand? Well, that’s because this has been his first year at school at the age of twelve, and at one point, we thought we would never be able to get him into education system. I met him about five years ago when I was an exchange student at Thammasat University. I visited my close friend’s hometown, and this boy’s family happened to be in the same village. My friend took me to his house, hoping that the parents could be convinced to send him to school. He was very very shy boy, and was always staying at home. He has been to a blind school before, but his family had to take him back as he couldn’t stop crying, missing home. His mother is a lovely person, but she loved him too much, and din’t dare to let him go to boarding school alone. Previous to that, I had met a professor from Poland, who really puts his passion into education for blind kids, especially in the field of tactile recognition. He kindly gave me something called “Wikki Sticks” which is a kind of soft rubber sticks which sticks onto smooth surface. You can form shapes and letters, and you can recognize them by touching. So I tried to play with him with bits and pieces of Braille patterns and Wikki Sticks. But to my surprise, he was not at all interested. I soon realized that it was probably because he has never been expose to so much “touching” and “feeling.” I myself enjoy touching various objects around me and explore the world in this way, but obviously, this has been possible since people around me, like family and teachers, have encouraged me to do that. Then, I really felt the needs for him to start learning in more stimulant setting like school. He showed the true power of education to me. He taught me by himself that going to school absolutely change someone’s life, regardless of different circumstances. I cannot be more happy for his wonderful start at school, and would love to congratulate his family to make a positive decision for his future. This weekend, Parn, my ex-roommate came to stay at my place. So we decided to go for shopping at a nearby local market and cook something for dinner together. Sunday market in Kochi, Japan, my hometown. I smile to myself how we got shocked to find lots of chicken cages right in front of the chicken meat shop in Kerala, India. (You can imagine how fresh the meat can be, right?) In a way, it gives me a sense of locality much more than museums and famous infrastructure, as markets are filled with things that directly speak to all senses. Here in Thailand also, you can find fresh market anywhere, and they are filled with mouth-watering smell of freshly cooked food, cheerful calling voices of all sellers, and people of all ages. How I wish I could go there as often as I like! It would be so great to be able to walk casually to the market after work and get some fresh food that you cannot get in normal roadside stalls. But the problem is, a local fresh market is a huge challenge for a totally blind woman to walk around. Wait, let me put it again. I can walk around, yes, my O&M teachers, but to get what I need?? Hmmmm… that’s a different story. The small vendors constantly changes their spots. The market is normally packed with people, so my beloved white cane cannot be of much help (Otherwise I’d trip and poke a dozen of people there). Certain things are quite easy for me to detect, like grilled corn on the cob, grilled chicken, fresh and not-so fresh seafood, pungent durian, etc. But what about Chinese cabbage and tomatos? Eggs? Meat, yes, because I can hear the butcher cutting meat with bones with a big butcher knife. But how about bread and uncooked rice? Hmmmm, right? So a visit to the local market is a kind of luxury for me at the moment. Actually, there is a trick: I could take a motorbike taxi, and let the driver accompany me. But sadly speaking, those motorbike drivers are not keen shoppers like us many women… Someone techy out there, please invent a cool device that can shout out “Passing a meat shop!” and “Fruits to your right” to me. Blind People Cannot Use ATM Card? １．Ａ　ｂｌｉｎｄ　ｐｅｒｓｏｎ　ｃａｎｎｏｔ　ｏｐｅｎ　ａ　ｂａｎｋ　ａｃｃｏｕｎｔ　ｂｙ　ｈｉｍｓｅｌｆ／ｈｅｒｓｅｌｆ　ｂｅｃａｕｓｅ　ａｌｌ　ｔｈｅ　ｄｏｃｕｍｅｎｔｓ　ｎｅｅｄ　ｔｏ　ｂｅ　ｆｉｌｌｅｄ　ｏｕｔ　ｂｙ　ｔｈｅ　ｓａｍｅ　ｐｅｒｓｏｎ　ｗｈｏ　ｓｉｇｎｓ　ｉｔ．　Ｉｎ　ｏｔｈｅｒ　ｗｏｒｄｓ，　ｂｌｉｎｄ　ｐｅｏｐｌｅ　ｃａｎｎｏｔ　ｄｏ　ｉｔ　ｂｅｃａｕｓｅ　ｗｅ　ｃａｎ　ｏｎｌｙ　ｓｉｇｎ，　ｎｏｔ　ｆｉｌｌ　ｉｎ　ｔｈｅ　ｆｏｒｍ. ２．　Ａ　ｂｌｉｎｄ　ｐｅｒｓｏｎ　ｃａｎｎｏｔ　ｈａｖｅ　ａｎ　ＡＴＭ　ｃａｒｄ　ｂｅｃａｕｓｅ　ＡＴＭ　ｍａｃｈｉｎｅｓ　ａｒｅ　ｎｏｔ　ａｃｃｅｓｓｉｂｌｅ　ｆｏｒ　ｔｈe blind. Tｈｅ　ｂａｎｋ　ｄｏｅｓｎ’ｔ　ｗａｎｔ　ｔｈｅ　ｂｌｉｎｄ　ｐｅｒｓｏｎ　ｔｏ　ｒｅｖｅａｌ　ｈｉｓ／ｈｅｒ　ｂａｎｋ　ｄｅｔａｉｌｓ　ｔｏ　ａ　ｔｈｉｒｄ　ｐｅｒｓｏｎ　ｉｎ　ｏｒｄｅｒ　ｔｏ　ｕｓｅ　ＡＴＭ． They might cheat blind people.